Really love food and service, restaurant was very busy but waiting staff still attentive. Food lovely and fresh. Ordered batter bits, to which our waiter went to ask the chef if this could be done, the answer came back as a “yes”. They didn’t arrive with the meal, asked for again when we ordered extra chips, but again they didn’t arrive. So we had asked for them twice, chefs were asked for them, but What is most galling is that neither of the waiters came to check that we had everything. What seems to be the issue is that you order from one person, another brings the order, extras are ordered from another waiter which are then brought by a fourth person. Sadly not great customer service. A nice restaurant, and the food was good, but service was slow and over priced. Great atmosphere & service - very tasty food! Excellent food. Great quality and variety of fishes. A great place to eat fish. It was brilliant that the restaurant had put a happy birthday sign up for my daughter, that was a lovely surprise. Our waitress was great, Angie. Food came hot and quick. Very happy with our visit. 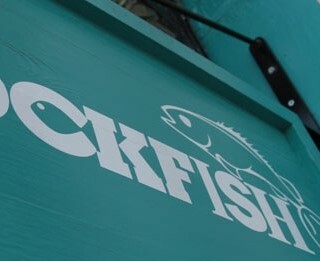 He was an absolute credit to Rockfish: friendly, knowledgeable, charming, and took excellent care of our coeliac daughter. He also recognised us from a previous visit which is always nice. Was a great lunch, our server kassie was lovely and gave us great service, loved the food especially the deep fried cream tea! Everything was great. Lovely staff and lovely food. We will be back. Enjoyable as always, good service, nice atmosphere. Hopefully next time we visit the bridge will be open linking to the Barbican. Fish was luke warm for two of us. Chip portions were very small and ‘unlimited chips’ didn’t turn up until we’d all finished what we had. Second time I’ve been underwhelmed given the price. Won’t be coming back. Rockfish Plymouth is consistantly good. The staff are a credit to the business and should be commended. Great location with fishing boats passing the window as we ate our locally caught Monkfish, Sardines and Gurnard. A lovely meal, very helpful and welcoming staff.